Nuberg is India's leading manufacturer of Nugen PSA Nitrogen Gas generator under technical collaboration with M/s. Rutgers CarboTech GmbH. 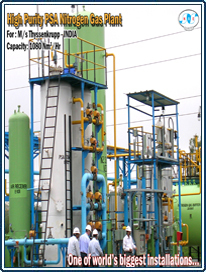 We have in house facility and expertise for manufacturing of various Pressure Vessels, Reactors, Adsorbers, Columns, Heat Exchangers, Tanks etc. Nuberg takes pride in providing quality equipments for Gas Generation, Gas Drying and Gas Purification systems. These equipments can be skid mounted and may be operated through PLC. We have numerous satisfied customers across the globe spreading over vide range of industry. Plant Capacity 1 - 1500 NM³/Hr. Process Description Nitrogen is generated from atmospheric air "on-site" by installing a Captive PSA (Pressure Swing Adsorption) generator. 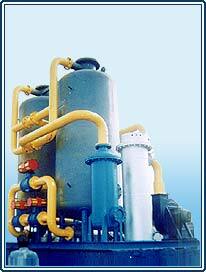 Various models suitable for producing commercial nitrogen and ultra pure nitrogen are available. Gas is used in various industries for creating inert atmosphere. 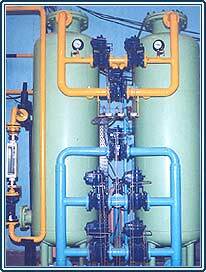 Gas produced by the plant is very economical as compared to cylinder / liquid nitrogen. Nuberg is India's leading manufacturer of Nugen PSA Oxygen Gas generator. We have in house facility and expertise for manufacturing of various Pressure Vessels, Reactors, Adsorbers, Columns, Heat Exchangers, Tanks etc. Nuberg takes pride in providing quality equipments for Gas Generation, Gas Drying and Gas Purification systems. These equipments can be skid mounted and may be operated through PL. We have numerous satisfied customers across the globe spreading over vide range of industry. Plant Capacity 1 - 1000 NM³/Hr. 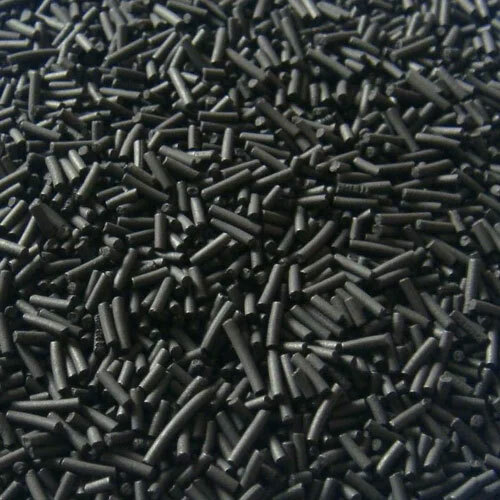 Carbon Molecular Sieve (CMS) are the central element of each & every pressure swing adsorption (PSA) system & are utilized in the production of nitrogen. With Carbotech Ac Gmbh Carbon Molecular Sieve nitrogen can be produced at unbeatably Low Cost & directly on site. * Inertise storage tank, pipeline & tanks. * Galvanization line for steel industry. * Edible oil manufacturing (Hydrogenation). * Polymer chips & refineries. * Produce Plastics, non-woven materials, microchips and a lot of other things. Nuberg has a technical collaboration with M/s Carbotech AC Gmbh since 1996 and over the years Nuberg has become the leading manufacturer of PSA Nitrogen Plant in worldwide, this is the result of many years of intensive R &D work, optimized process and a thorough quality control that allows us to be maintaining the market Leadership.